Made of water repellent polyester with EVA reinforced front panel. ; Full length zipper allows easy removal of garments from the bag. 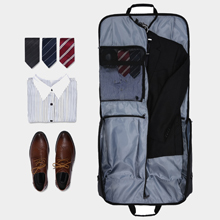 Multiple interior pockets provide added storage space, keep suits, dresses, shoes and ties neatly and wrinkle-free. Front pocket for quick access to electronics and business documents. An interior buckle holds your garments in place, ensuring that they don’t crease or crumple during travel. Exterior Adjustable and detachable shoulder strap for comfort and convenience; Carry handle for easy lifting or hanging. 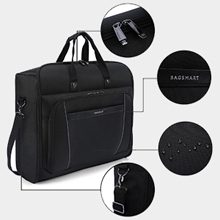 Suitable for business trip ,travel, weekend getaway and home storage. 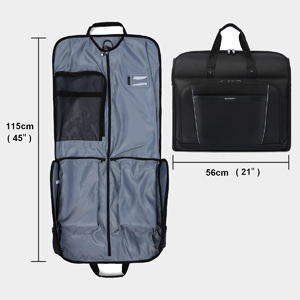 This garment bag is long enough to hold garments, dresses,suits , shoes, documents and others. 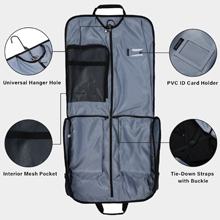 Multiple interior zipper pockets making your suits, shirts, ties, shoes neat and organized and easy find what you need quickly. 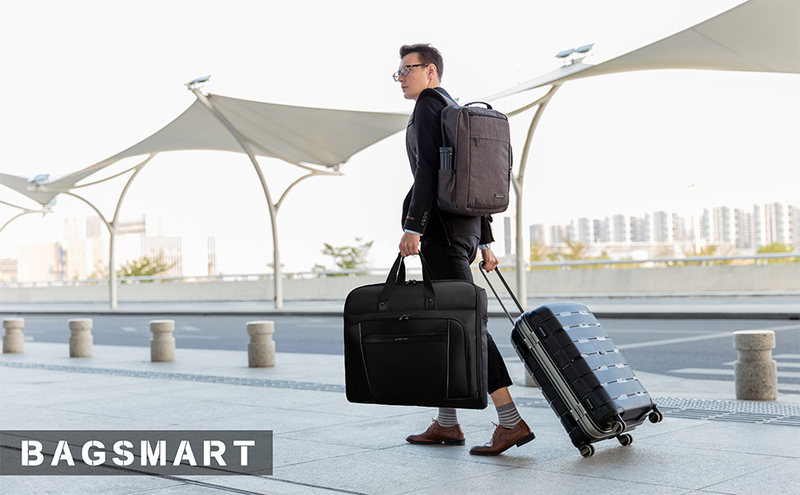 Convenient exterior front pockets provides easy access to electronic, pens, ear buds, passport, travel or business documents. Two tie-down straps with buckle holds your garments in place, ensuring that they don’t crease or crumple during travel. 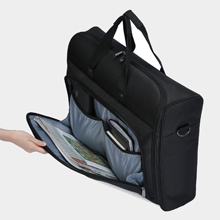 This travel garment bag’s shoulder strap can be adjusted and fully detached for out-of-the-way convenience.